I couldn't resist adding the picture of my cover here. Isn't he the cutest???? I've been working on some ideas for new stories now that the edits are finally finished on my book. But the process hasn't been easy. There's so many ideas, but so little time. I start one then think of another and that's followed by a third that might be even better than the other two. How do you decide on just one to develop? It's like trying to decide which child to send to college while the others learn a trade. But the idea stage is often the most fun. There's the most possibility at this stage. You have a man and a woman. They each want something. Then there's conflict that keeps them apart. But the path they follow can vary depending on how you develop the idea. There's so many forks in the road. A lot like our own life's journey. One choice leads to another to another and so on... But if we could go back and change one thing, it would lead to a different path. A different story. So I'm enjoying this phase but need to leave it soon and start the actual BICHOK (behind in chair, hands on keyboard) writing phase. What phase are you all in right now? 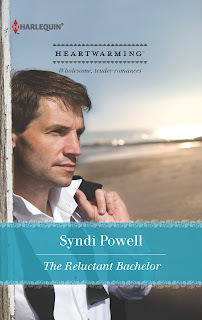 Syndi, love your cover and the book title. I'm in the phase of sending in possible titles on an American Romance I just finished. I brainstormed with my critique group, because sometimes I feel brain dead when it comes to titling a book. I knew the working title wasn't going to fly on this story. I've just started to write the sequel. I love the thinking up possible story part and love starting a new book. Then it gets to be work to make everything mesh. Ugh, titles. I think I'm title challenged. Good luck with the new book! It can get complicated when you write with a partner. We changed our minds about a plot element for the second book of our trading post series, and it was like the proverbial dominoes. It entailed a major rewrite we never saw coming. I like the new direction, but wow are we putting in overtime right now. He is gorgeous! Great cover-as usual:) I just received my June releases and the covers actually look even better up close! I'm in so many stages that I'm actually feeling a little dizzy. I'll be doing line edits on my November release in a few weeks, and in the meantime I'm finishing book two for submission by July 15 and writing the synopsis and the first three chapters of a possible book three to submit to my agent. Oh, and we decided to throw in a family vacation to Disneyland in the middle of all of this for my son's birthday:) I must have been crazy to book the trip when I did, but as we've all said before-family and love come before all else. Jen, yes family and love do come first. What a great reminder. Good look with the submissions and keep us updated! Good luck with the writing, writing, writing! Great cover. I've got proposals in and can hardly wait to find out what I'll be working on next. Pamela, that's great news! Be sure to keep us updated.